It makes the carnivorous Venus flytrap look downright tame. A monster plant with flowers the size of umbrellas and sap that causes blisters, scars that last years, and blindness is spreading across New York, according to the state Department of Environmental Conservation. It's an invasive species called the giant hogweed, and the DEC seeks help locating outbreaks so they can send crews to nip it in the bud. According to the agency, the plant's sap contains photosensitizing furanocoumarins, which can cause a serious skin inflammation within 15 minutes of skin contact in conjunction with sunlight. The sap prevents skin from protecting itself from sunlight, according to health and safety instructions from the DEC, which leads to a very bad sunburn. Heat and moisture (sweat or dew) can worsen the skin reaction. The agency has a Giant Hogweed Hotline at 845-256-3111 for people to call and report sightings. Callers are asked to provide photos and site information, but avoid touching the plant. This is DEC's fourth year of controlling giant hogweed. Six crews totaling 14 people will visit most of the 944 known giant hogweed sites. Sites with less than 400 plants will be controlled by hand cutting their roots; sites with more than 400 plants will be controlled with herbicide. Giant Hogweed Do Not Touch This Plant! What to do if you come in contact with giant hogweed: This plant poses a serious health threat; see your physician if you think you have been burned by giant hogweed. If you think you have giant hogweed on your property, do NOT touch it. 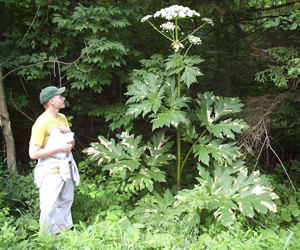 How do you identify giant hogweed? Giant hogweed is a biennial or perennial herb in the carrot family (Apiaceae) which can grow to 12 feet or more. Its hollow, ridged stems grow 2-4 inches in diameter and have dark reddish-purple blotches. Its large compound leaves can grow up to 5 feet wide. It's white flower heads can grow up to 2 1/2 feet in diameter. Please refer to the Giant Hogweed Identification page for further help. Some other plants look very similar. If you need additional information or assistance in identifying your plant, you may call us at 845-256-3111. You will be asked to describe the plant height, stem color, leaf shape, flower color and shape, as well as give directions to the plant site. If you can take digital photos and email them to us, it would help us identify your plant. Where is giant hogweed found? Giant hogweed is a native of the Caucasus Mountain region between the Black and Caspian Seas. It was introduced to Europe and the United Kingdom in the late nineteenth century and to the United States in the early twentieth century as an ornamental garden plant. It has become established in New York, Pennsylvania, Ohio, Maryland, Oregon, Washington, Michigan, Virginia, Vermont, New Hampshire and Maine. Seeds may also be distributed by birds and waterways, and can remain viable for over 10 years. The map to the right displays the current confirmed locations of giant hogweed sites in New York State.